Berkeley Earth Surface Temperature study. In our continuing adventure comparing the last data from Berkley Earth Surface Temperature project (BEST) today we are looking at Washington State. NOAA/NCDC data suggests the last 5 years have cooled off considerably in Washington State. But even more interesting is that the 10 year period from the late 1800s to around 1907 was in fact warmer than the last 5 years. Here is the NOAA Washington Data. The boxes are 5 year averages. Blue is below the 1951-80 average. Red text indicates warmer. As you can, the average for the last 5 years is .16C while the late 1800s early 1900s have anomalies of .44C and .47C. It ruins the AGW narrative for it to be so warm so far in the past. Here is the same period using the BEST data. As you can see the same 1800s/1900s period is now -.2C and -.19C below the 51-80 average and much colder than the recent period. How did they do that? BEST adjusted way down all the data before 1926 or so thereby artificially cooling the warm past. The following graph is the BEST anomaly minus the NOAA anomaly. They didn’t do much to the post 1930 data. Clearly they did not want anyone thinking it could be warm in the past. 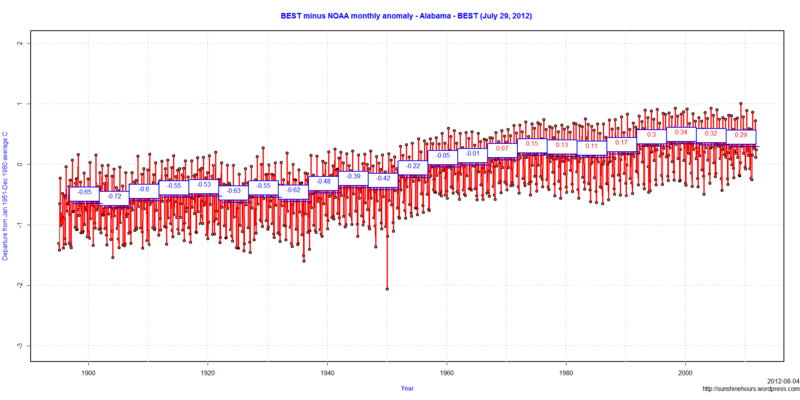 I started comparing the July 29, 2012 BEST release to NOAA’s data here with Alabama. Unlike Alabama which according to NOAA has cooled since 1895, North Dakota is one of the fastest warming states according to NOAA. I assume BEST was happy with a fast warming state so they just warmed all the data. Every 5 year period (except for 3 and 1 no change) were warmed a small amount. I cannot help but consluding that BEST had a goal in mind , or more likely their algorithm was designed to make all trends rise from past to present. If the real trend wouldn’t cooperate (like Alabama) they cooled the past and warmed the present. If the real trend was in the right direction, they just pretended to adjust the data. I thought I would compare TAVG data from the new BEST release to the NOAA data for the state of Alabama. I got the BEST data here. I got the NOAA data here. The BEST anomalies are as of 1951 to 1980. So I calculated the NOAA anomalies for Alabama using the same time frame. Then I convert NOAA anomalies from Fahrenheit to Celsius. Hmmm. They don’t look too similar. So I double checked. 16 for Jan 1950? Yes, Jan 1950 was the warmest January in Alabama history according to the NOAA. It averaged 60F, which is 16F above the 1951-1980 average. So, lets graph BEST minus NOAA_C. Whaaatttt! No wonder BEST can claim warming occurred after 1960. They cooled all the pre-1960 data and warmed all the post-1960 data (compared to NOAA)!! BEST – Why no cooling in the Southeast? I originally wrote this as a comment on WUWT. There are six states which have a negative trend from 1895 as of the end of 2011. Alabama, Georgia, Mississippi, Arkansas, South Carolina and Tennessee. 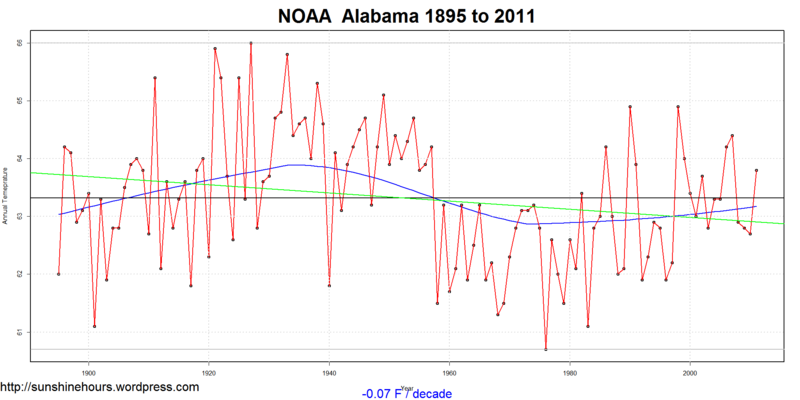 Here is an example of Alabama’s NOAA data graphed. BEST didn’t find any negative trends. It even gets discussed in papers. Even the South Carolina State Climatology Office recognizes it. How could BEST not find a cooling trend when a lot other people can? A continuation of the series on BEST’s TMAX data for USA states and the CONUS and the whole USA. The most recent 5 years of BEST TMAX data is ranked #6 for the CONUS and #4 for all states. Notice the periods warmer like 51-56 and 31-36. Notice that the current period in .31C colder than the warmest period. Notice how few #1’s there are in the rest of the list. I think Muller’s own data demolishes his silly CO2 theory. BEST – USA 5 years averages fall off a cliff continued. Continuing from last post. Looking at BESTs TMAX data state by state I noticed that the last 5 years temperatures had fallen off a cliff. Cold! South Dakota – The current 5 year period is 16th warmest! Wow. BEST – USA Tmax fell off a cliff on west coast. Alaska – tied for 3rd. .83C colder than previous 5 year period. North Dakota – #12 1.61C colder than the warmest period!